I had pretty high expectations for Hell Girl (Jigoku Shōjo). Admittedly, they were formed by little more than a love for Japanese horror and awesome box art - but let's be fair, who doesn't like j-horror and you never underestimate the power of good box art. It didn't quite live up to my hopes, but in spite of its many, many flaws, I somehow wasn't terribly disappointed either. "Beyond the veil of midnight lies a website, HellCorrespondence.com. Type in the name of the one upon which you desire retribution ... And it will be served." By submitting a name you will poke summon the Hell Girl, Ai Enma. She will offer to you a doll with a scarlet thread around its neck. If you untie the thread she will settle your grievance and ferry your tormenter's soul straight to hell, in exchange your soul will also be damned... and you get a nifty tattoo. It's a flimsy premise and any sign of an overarching story is nonexistent for some time, but since when has that made any difference in horror? Horror - especially Japanese horror - often deals heavily in mystery, only unveiling its true nature and intentions as it nears the end. Such is exactly the case with Hell Girl. The season is built almost entirely of self-contained episodes that can be discerned into three distinctive phases. Its final form is sure not to disappoint, but what about the other two stages? Unfortunately it is a long, repetitious ride to the conclusion, one filled with many hills and valleys. Series that are made in a similar vein work because they create anticipation for the inevitable reveal. In Hell Girl there is nothing to be revealed: the solution is given to us before the episode even begins. Compounding the issue, we are generally presented with the conflict of each story within the first few minutes, therein eliminating the possibility of employing the "how did it come to this?" method of storytelling. The only question to ask is 'will they untie the thread? ', and despite attempts at misdirection, we learn relatively quickly: yes, they always do. Ai will come for your target's soul; she will not be outran, outwitted, or stopped, you will gaze sorrowfully at branding on your chest. Far too rarely are we thrown a curve ball. Making matters worse Ai and her companions are strangers to us. They are nothing more than anonymous exterminators fumigating a different house each episode, which makes the insects the only thing for us to care for... and they're disposable. The audience is left to infer "who - or what - is Hell Girl?" as the preeminent conundrum of the season, but sufficient reason to give a damn simply isn't given. We know practically nothing about Ai, yet she doesn't come off as being mysterious at all, which is actually a huge problem. Rather than finding myself wanting to watch the series to know who Ai Enma is, I find myself wanting to know who Ai Enma is because I'm watching the series - and it gives us little cause to do so. It's not long until the viewer desperately finds themselves hoping for something to create continuity, anything at all, to give the show drive. It's not until the eighth episode that we meet the Shibatas, the first reoccurring characters. Sadly they spend most their time arbitrarily floundering about bringing very little relief to the repetitious formula. By the end of twenty-first episode the series finally begins to move with purpose for the first - and only - time. Does this last solitary arc justify the rest of the season? Like they say, "The decision rests with you." For me it did, if for no other reason than it opens up a world of potential for the second season. Though the first would likely leave its audience more satisfied with its number of episodes halved. The awesome prowess of the box art extends to all ends of production. To say the visual style is impressive would be an understatement; it creates a realistic world, rich in detail, yet able to become devilishly surreal when the moment arises. The main cast is recognizable enough, but most the other characters are easily forgettable. I assume this is deliberate. 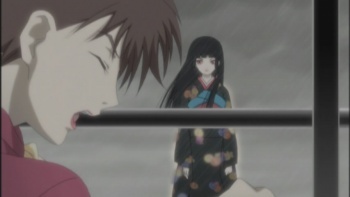 Hell Girl focuses on everyday people, most of which should be forgettable. This greatly enhances the presence of the hauntingly beautiful Ai; she can be welcoming and at the same time frighteningly cold, vulnerable but omnipotent, indifferent and yet full of sorrow. The music follows a minimalist approach only picking up for moments of extreme intensity. While at these times the music is very good, the same themes are used throughout, causing it - like the season as a whole - to fall victim to repetition. Bottom-line: Hell Girl's standalone episode format causes it to quickly become repetitious. As always when dealing with self-contained episodes each can be hit or miss. The season finishes strong, but before that it goes nowhere for far too long, and for many it may not be worth the effort. Though, one's view could dramatically differ based on how they watch it - though I don't think a great deal of people that purchase anime DVDs limit themselves to one episode a week. Recommendation: I would recommend Hell Girl based solely on the fact that it's bound to be one of the most badass looking DVDs on your anime shelf... Joking aside, I have a hard time recommending this without knowing if the second season lives up to the potential created by the conclusion of the first. Salvan Bonaminio wants to point out that Macs fester for an eternity in purgatory... he is also prepared for the stoning that may take place as a result of this comment.